Need ideas for easy slow cooker chicken dishes? This simple slow cooker orange chicken is probably the easiest, fastest and most comforting recipe you could make in a slow cooker! As much as I love cooking, I’m not one to spend hours in the kitchen! We’re always short on time so we need quick and simple but delicious recipes, especially for dinner. This slow cooker orange chicken is not only super yummy and a lot better than takeout but comes together pretty easily and quite fast. 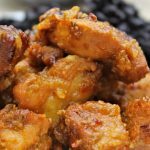 The best slow cooker chicken recipe! The beauty of using a slow cooker to cook your meals is that you can actually walk away from your food and do other stuff while your beautiful dinner gets ready. You could even relax with your family and share your day with each other. We love spending time together and sharing our highs and lows of the day, over a glass of wine or a cup of tea! We also love chicken recipes and we’re pretty crazy about this orange marmalade I made a while back! And as I just got my first slow cooker I thought I should test its magic with this slow cooker orange chicken using my homemade orange marmalade. This easy slow cooker chicken can be made ahead and is one of those recipes that are a complete lifesaver for the days when I have little time to meal prep. And those happen pretty often around this household (one might wonder why lol) I absolutely love the idea of simply pouring everything into one pot and getting fabulous results with such minimal effort! 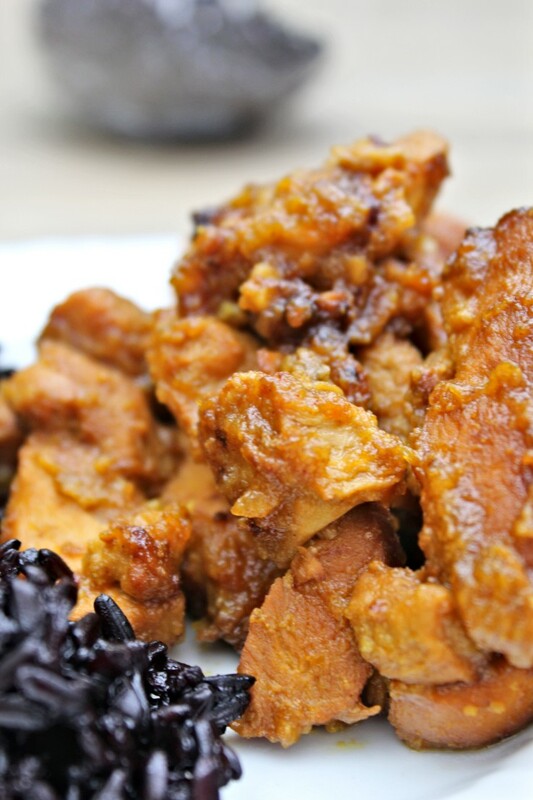 We loved how this simple orange chicken with orange marmalade turned out! A little sweet, a little sour with ajust a hint of spicy, this easy slow cooker chicken is so flavorful and tender and the orange sauce is thick and sticky, just the way we love it! 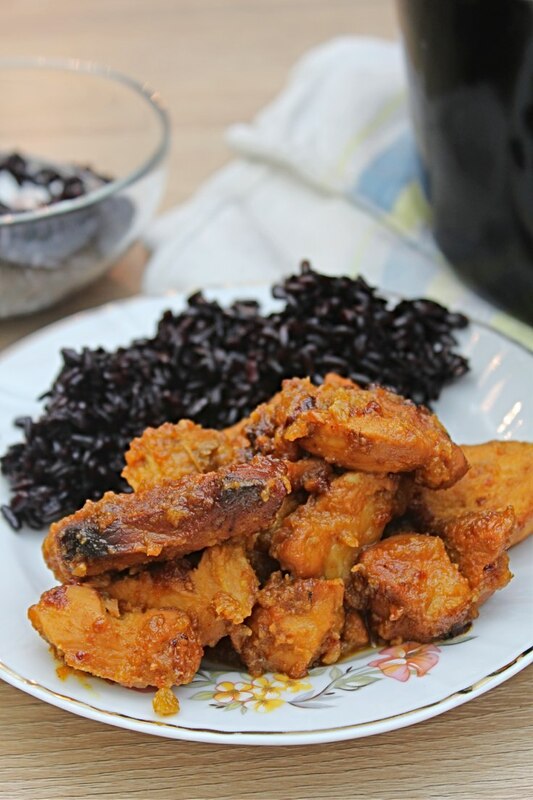 It’s a version of the Chinese orange chicken, that I find a lot healthier than the classic recipe, and to me it tastes less sugary because my orange marmalade is not super sweet. 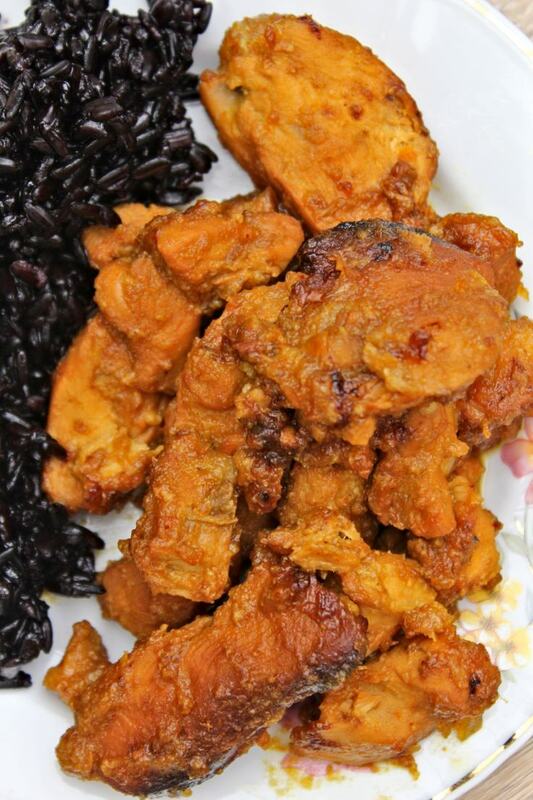 This delicious slow cooker orange chicken could easily be cooked with fresh oranges and orange juice and this would make the recipe even healthier. But since we have so much orange marmalade I thought it would be a shame not to use it in some recipes to create even more delicious recipes that we can add to our list of most favorites! I cooked for two small people (Ellie and I) so the slow cooker orange chicken in my photos and video might seem a little lonely lol But the ingredients listed below are for 4 people. Please adjust as needed! This recipe was created with chicken breast but you can use chicken drums too. For this recipe I used ingredients I wasn’t very comfortable with since I don’t cook with these as much. But it turns out they blend very well and create a wonderful concoction of flavors! I made a marinade of balsamic vinegar, soy sauce, sesame oil, my homemade orange marmalade, salt and pepper. If I had more time, I would’ve placed the chicken in this marinade for at least a couple of hours before proceeding to cook it in the slow cooker. I used chicken breasts, skinless & boneless which I thought would be better to cut in chunks. But you can always dice the breats or even cook it whole. I tossed the chicken pieces in a little bit of flour and slightly cooked in vegetable oil until light brown. Alternatively you can boil the chicken until the inside is no longer pink, for a healthier variation of this recipe. To add a bit more citrusy flavor to my orange chicken breast I used some lime, cut into wedges. I added to the oriental flavors with sesame seeds and paprika powder. This recipe can be cooked for about 4-5 hrs on low or 2-3 hrs on high. I didn’t want to speed up the process this time so I cooked my chicken on low to make sure the breast is very tender. When almost ready, I sprinkled the sesame seeds and the paprika and mixed to coat well. 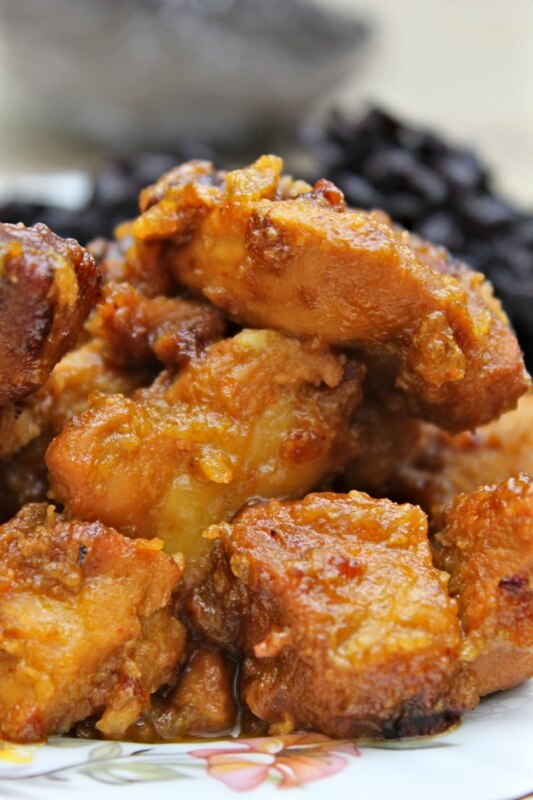 The video recipe features a slightly different version of this orange chicken. Check out both to decide which one fits you best! 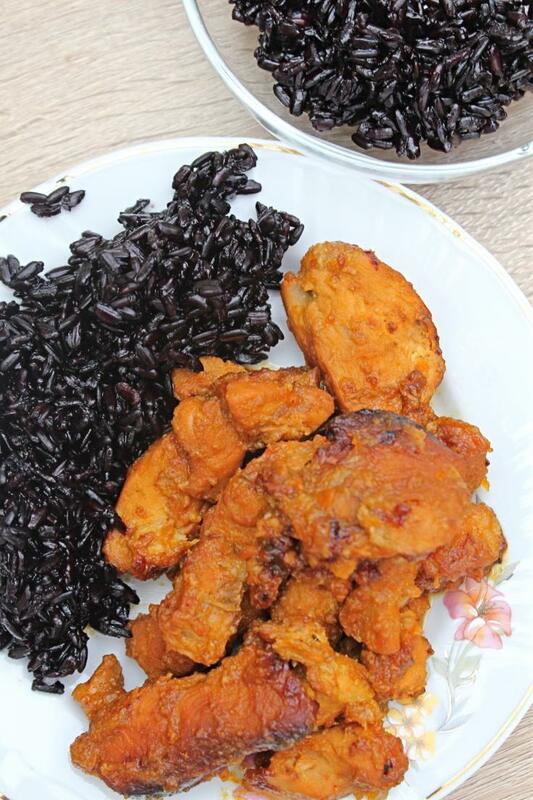 In a medium bowl, mix balsamic vinegar, orange marmalade, sugar if needed, sesame oil, salt and pepper and soy sauce. Set aside. Cut chicken breast in smaller pieces. Place the chicken pieces into a large bowl and sprinkle the flour. Toss chicken to coat well. In a large non stick skillet, heat the vegetable oil and roast chicken until light brown, about 5 minutes. Add chicken and orange marmalade mix to the slow cooker and mix well. Place the lime wedges into the pot. When almost ready, sprinkle the sesame seeds and the paprika and mix to coat well. Love chicken like this i love myself some orange chicken i GETS it’s all the time at chinese place don’t have to now hot receipe thanks for it! !❤!